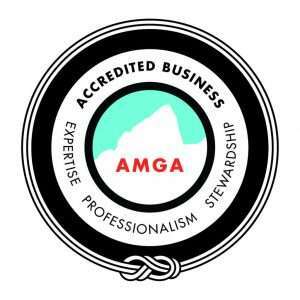 What does it mean to be AMGA Accredited? 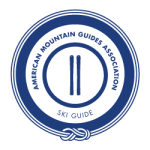 Accreditation is based on the American Mountain Guides Association’s Scope of Practice. Accredited Guide Services like us, commit to staffing our trips – your trip – with guides who have been trained to work in that type of terrain. While this may sound like a given, it is not. 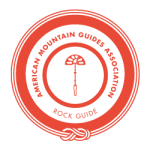 Many guide services cannot provide you with a certified guide, because most guides are not certified – and many are not trained by any outside entity. At Timberline Mountain Guides, we only hire guides who have begun a training and certification process that is both challenging and voluntary. They choose this path out of a commitment to their profession, despite significant costs and time associated. These guides put themselves in front of their peers, instructors and examiners in order to receive feedback that will help them improve as guides and, ultimately, achieve international certification as a Mountain Guide. The American Mountain Guides Association is the only organization that trains and certifies guides to an international standard. During the training process, guides agree to work within their scope of practice – the terrain that they’ve been trained in. Apprentice Guides in each discipline have taken the first level of training that sets professional guides apart. In the case of the alpine, this means that they can guide alpine climbs of moderate size and difficulty with mentorship and supervision. Assistant Guides have taken additional coursework, passed a preliminary exam, and gained a great deal of professional guiding experience. They can guide larger and more complex routes with continued mentorship and increasingly less direct supervision. Certified Guides can guide routes that are as large and difficult as is appropriate for themselves and their guests. Not every guide who is trained, is certified. Simply starting the training is a huge step forward for a guide. Often, it is their first introduction to professional standards that they will come to see as fundamental. Certification as a guide in any of the three disciplines take years, and signifies a deep commitment to professional development. Over that time, personal experience complements professional apprenticeship and mentorship. 12 days of examination split over a shorter qualification exam, and a nine-day Alpine Exam. Guides who receive certification in all three disciplines (Alpine, Rock and Ski Guide) are called American Mountain Guides. They are licensed internationally as IFMGA Guides – a title that is coveted around the mountain climbing world. 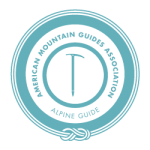 Timberline Mountain Guides has American Mountain Guides/IFMGA Guides on staff throughout the year, and most of our guides are certified in at least one discipline. To learn more about the AMGA, we recommend that you start here. Each guide has their personal level of training and/or certification listed in their bio.